I recently returned from an amazing trip to Napa and Monterey, California. You can read my Foodie’s guide to Napa Valley and The Best of Monterey Bay, California. I definitely indulged and enjoyed the best food that California offers. But as much as I love incredible food, nothing beats a home cooked meal. 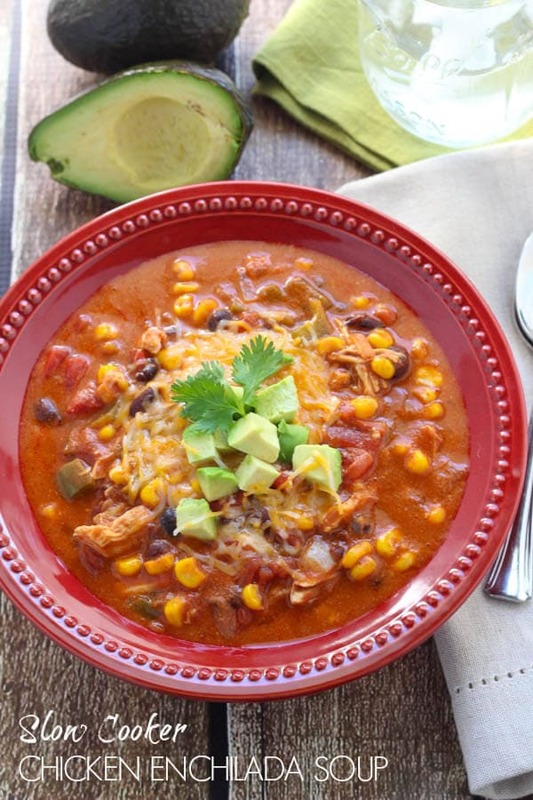 Slow cooker chicken enchilada soup is on the menu at my house for dinner tonight! *One the day I updated this post with new photos in October 2017, fires are raging in wine country, threatening many homes and businesses. Please keep the people affected by the wild fires in California in your thoughts. The California Wine Country is one of my favorite places to visit in the United States and the fires are devastating. 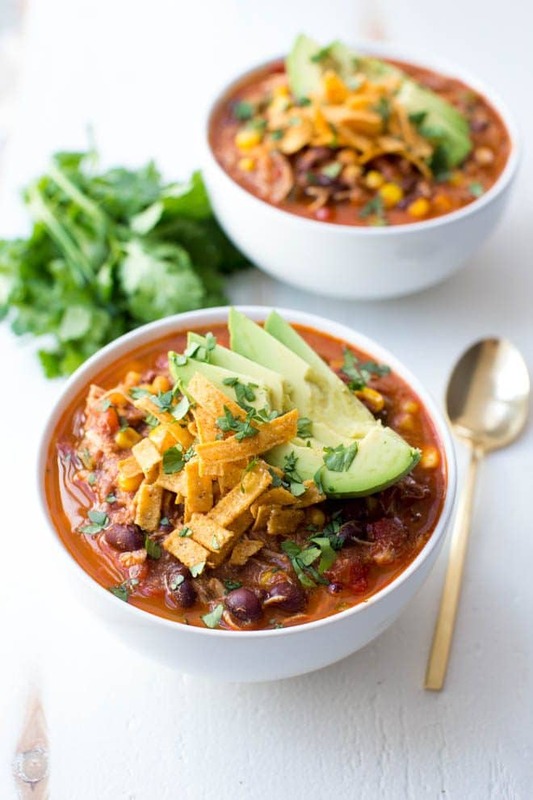 Out of all the meals we cook, this chicken enchilada soup makes a regular appearance at our dinner table during the cooler months. 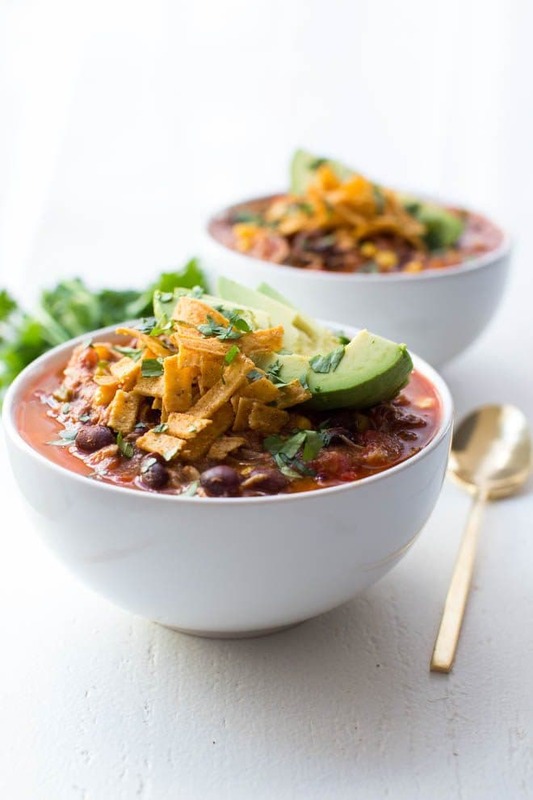 This soup is the perfect meal because it is warm, comforting and packed with flavor. 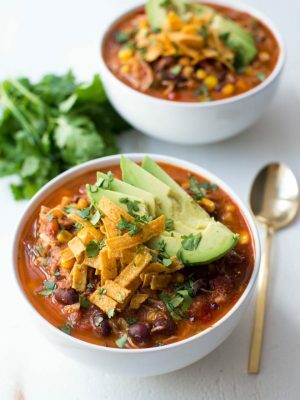 Perfect for weeknights or cool fall days, slow cooker chicken enchilada soup is loaded with delicious vegetables. 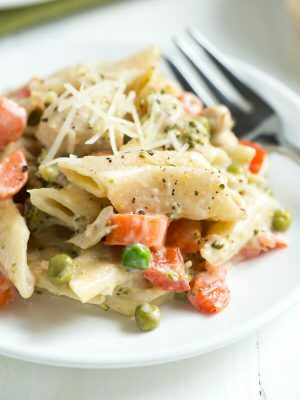 Fill your crockpot, let dinner cook for you and come home to a kitchen that smells good and a meal ready to be enjoyed. 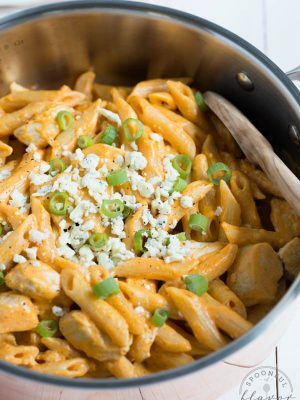 This recipe is barely adapted from Dainty Chef and is definitely worth posting because it is one of absolute favorite meals. I like to lighten up the recipe slightly, but the flavor and consistency is the same. In a saucepan over medium-low heat, melt butter. Add flour and stir until smooth and bubbly. Remove from heat; slowly add ½ cup chicken broth and ½ cup milk. Whisk to keep smooth. Return to heat. Bring sauce to a gentle boil; cook, stirring constantly, until it thickens. Remove from heat. Add enchilada sauce, remaining milk and remaining broth to heated broth mixture. Whisk until smooth. Set aside. 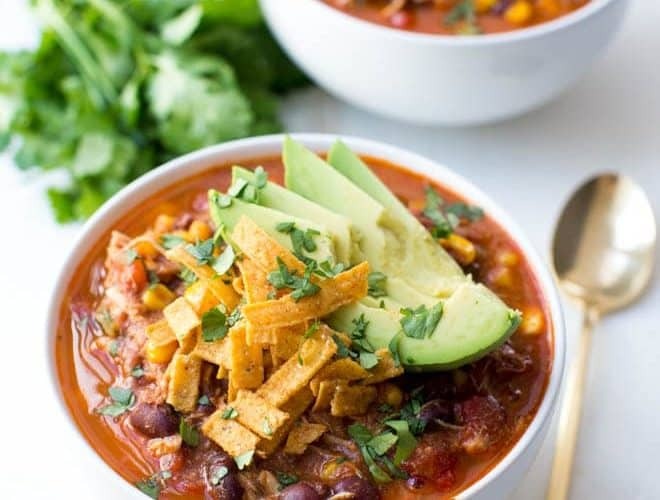 In a slow cooker, combine drained beans, tomatoes, corn, onion, and bell pepper. Place the chicken breasts on top of the mixture. Pour sauce mixture over ingredients in cooker. Cover; cook on low heat for 6 to 8 hours or on high heat for 3 to 4 hours. When the chicken is cooked through, remove chicken and cut or shred into bite-sized pieces. Add chicken back into the soup and mix well. 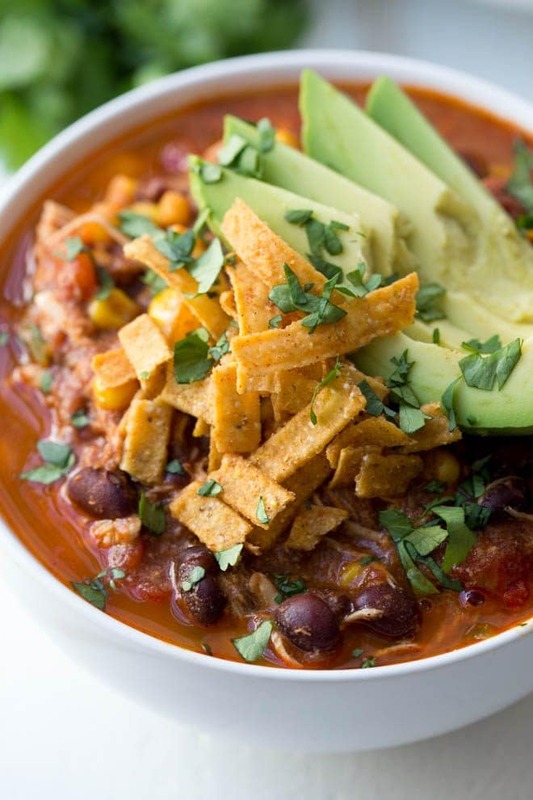 Top with cheese, sour cream, avocado or tortilla chips, as desired. Hi! Your recipe looks delicious! 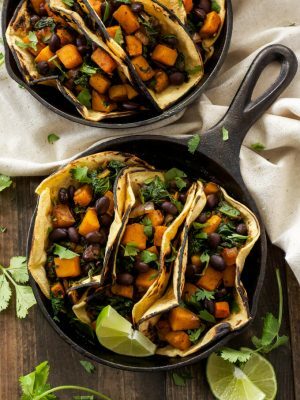 Should the black beans be dry or cooked beans? Thanks! Hi, Jennifer! They should be cooked beans. I use canned beans to make it easy. Enjoy! Thanks! It turned out delicious! I'm glad you loved it, Jennifer! 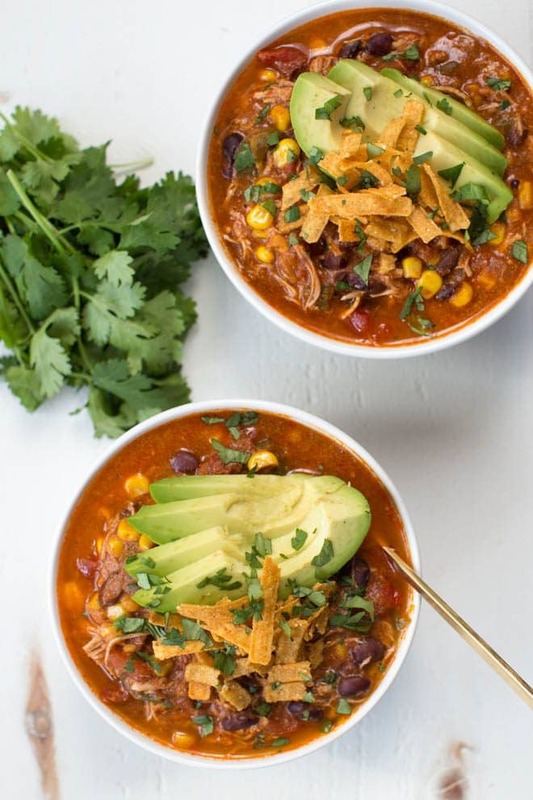 This recipe is one of my favorite slow cooker meals.